In fact, there are so many options for sprucing up your rock landscape that you’ll probably have a hard time choosing. You have lots of choices here. The red bird of paradise (Caesalpinia pulcherrima) with its bright orange-gold flowers is a favorite in the Phoenix metro area. It does well in full sun and can reach a height of 6 feet. Another popular choice is the Baja fairy duster (Calliandra californica), which has dark green leaves and red powderpuff flowers. For a less splashy choice, try the Mexican buckeye (Ungnadia speciose), which needs little water and can grow to 10 feet. It will brighten your landscape with rosy pink flowers in the spring. This group includes the yuccas, agaves, and aloes. The octopus agave (Agave vilmoriniana) can add a touch of fun to your landscape with its curvy “arms.” Parry's agave (Agave parryi) is a more classic form of the plant and needs very little water. Other good choices are cape aloe (Aloe ferox), which has orange-red flowering spikes in the spring, and slipper flower (Pedilanthus macrocarpus), with its graceful, slender light green foliage. 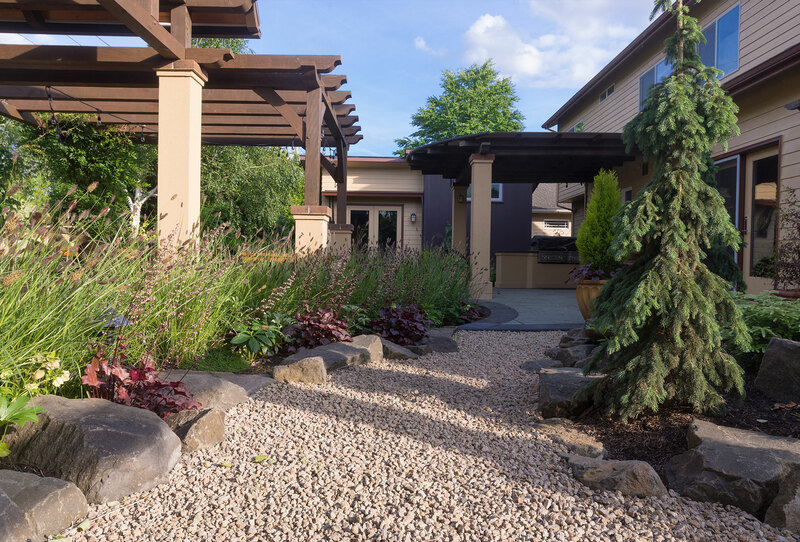 Strategically placed ornamental grasses can soften the look of a rock garden and require much less water than traditional lawn grasses. Deer grass (Muhlenbergia rigens) looks lush but not unruly, grows well in either full or partial sun, and requires little water.Pink muhly (Muhlenbergia capillaris) is a showier choice, with its airy pink plumes. Groundcovers add color and texture and help minimize dust in your rock garden. The red spike ice plant (Cephalophyllum 'Red Spike') with its bright magenta blooms is a fun choice, while trailing rosemary (Rosmarinus officinalis 'Prostratus') or myoporum (Myoporum parvifolium) are more sedate options. Add more lush beauty with perennial plants. Some will live only a couple of years, but others will come back year after year. Desert marigold (Baileya multiradiata) is a great choice that requires little water and rewards you with cheery daisy-like yellow blooms. Various varieties of penstemon (coral, canyon, and firecracker penstemon are a few of the choices) are also classic desert beauties. For more great choices and some beautiful ideas on how to artfully combine desert plants, check out the Arizona Municipal Water Users Association guide. At MDI Rock, we're happy to help you create a beautiful landscape. We supply a wide range of products for all sorts of uses at competitive prices. In addition to our many choices in decorative groundcovers, we provide rip rap, flagstone, topsoil, sand, gravel, and a huge selection of boulders.